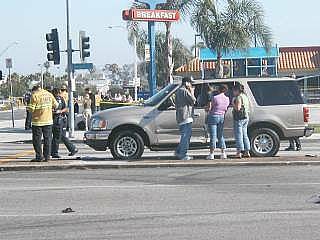 (July 1, 2005, updated from initial post) -- An L.A. County Sheriff pursuit on Friday afternoon -- which included a suspected reckless and/or drunk driver speeding southbound on Bellflower Blvd. 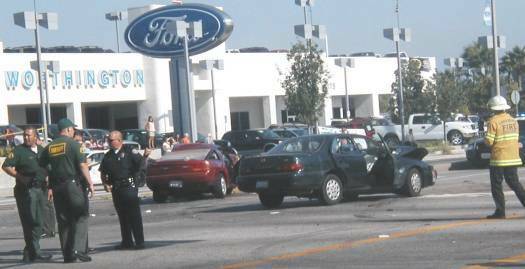 for a time in the northbound lanes -- ended in a multi-vehicle crash at Bellflower Blvd. and Spring St. The suspect was driving the purple car, above. 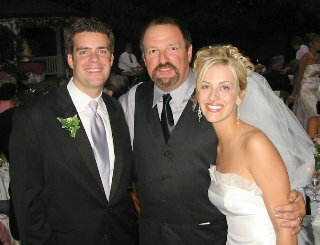 He died of injuries sustained in the crash. Several innocent drivers found themselves caught up in the conclusion to the short but destructive pursuit. Crowds gathered at the busy ELB intersection. Bellflower Blvd. and Spring St. were blocked off in both directions. Traffic was rerouted onto other streets; for a time, buses were traveling on Wardlow Rd. 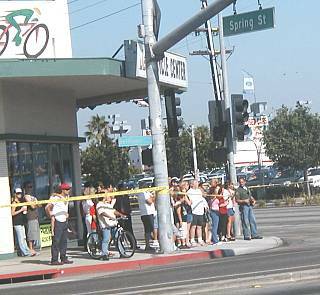 TV news helicopters created a din overhead L.A. TV outlets carried the story near the top of their afternoon newscasts. LBReport.com will update this page as further details emerge. Revisit this page, click refresh or reload on your browser for updated text.